Bali is a surfers playground. Everyone from beginners to pros come for the surf. I came in hopes to challenge myself and attempt the sport. I gave up when I realized I was more likely to catch a board to the face than a wave. 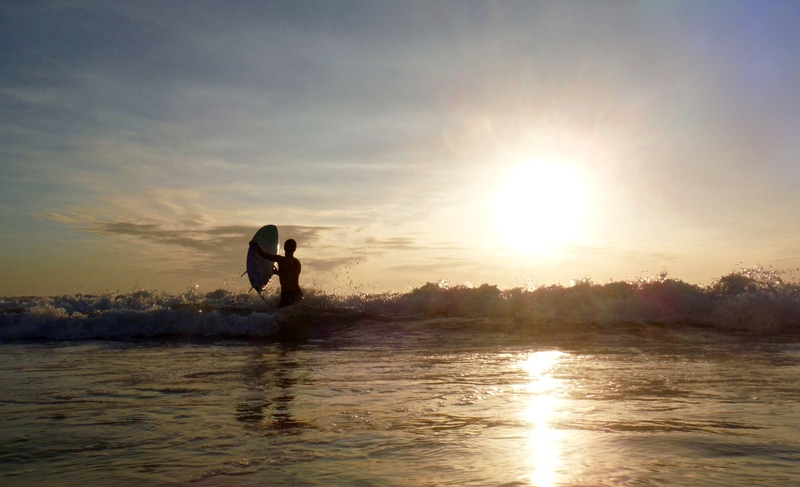 Turns out I was far from the only person with the grand idea of surfing in Bali, go figure. The horizon is dense with bodies bobbing up and down. I’ve enjoyed taking a back seat and watching impressive surfers take charge of the ocean. A Balinese sunset will make you forget about any stress and the many crowds. The slow set of the sun can’t be beat. Evenings are best spent sitting on concrete stairs eating steamy sweet corn on the cob, slowly sipping cold beer, and watching surfers make their way out of the water, clinging to one last wave. Dogs run around and cameras snap away trying to capture the moment like it’s the last sunset on the planet, and for a moment that’s just how it feels.